I am a tree-hugger. Whenever I meet one that I love, I really do want to wrap my arms around the trunk and feel that immense strength, hoping to absorb some of it. 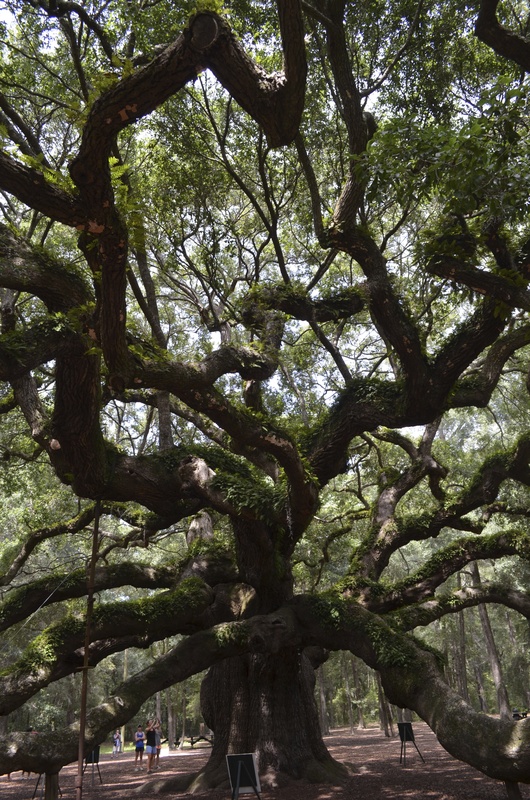 The Angel Tree is in a park owned by the city of Charleston, even though it’s on John’s Island, a bit out of town. 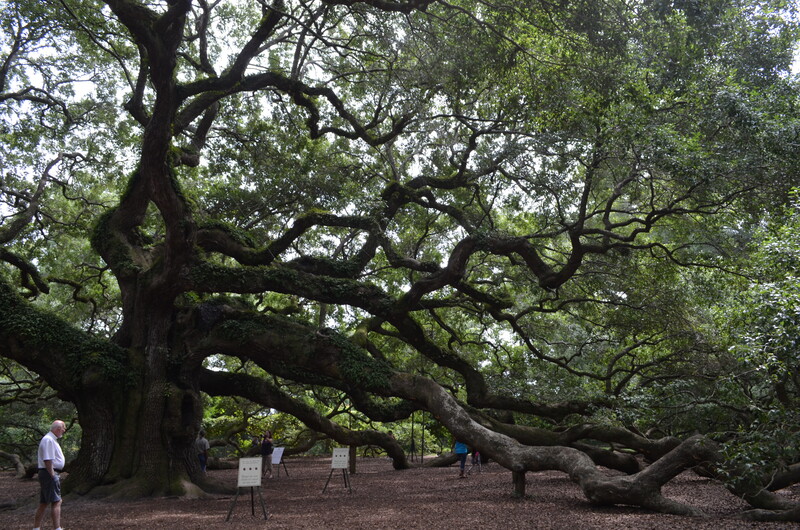 The tree has a very sacred feel, but it is named after the Angel family who used to own the property. 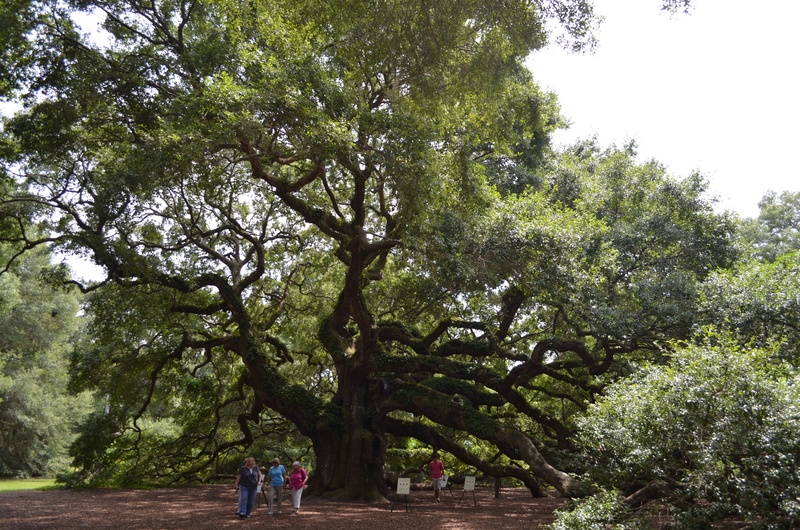 The tree is estimated to be 400-500 years old, which means it was here when only Native Americans lived in the area, before the Europeans arrived. In 2012, developers proposed a giant condo complex nearby that would have possibly altered the environment in the area, but other lovers of this tree prevailed…Thank You! Looking for the Angel Tree takes you on the highway out of Charleston, on the way to Kiawah Island. There is only a small sign to mark the tree and you turn onto a very rough dirt road that might discourage you from going further if this weren’t your destination. 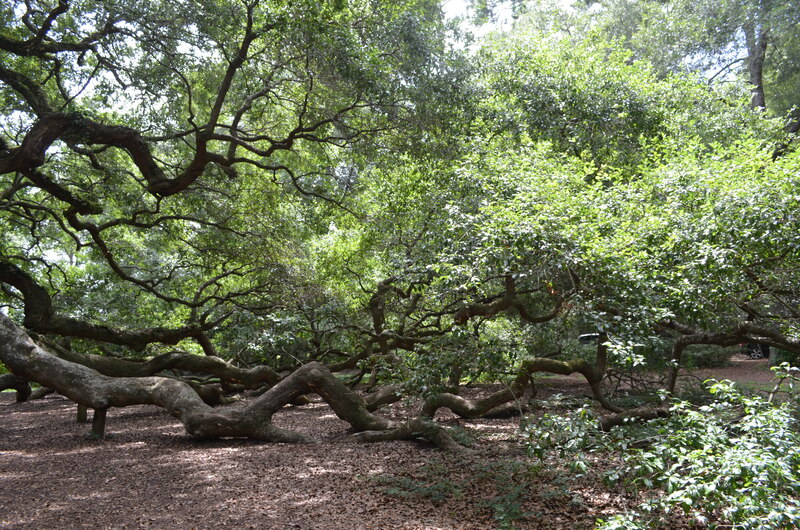 You drive through what could be a spooky forest of oaks draped in Spanish Moss until you see a clearing on your left. There is a small sign on the right and before you reach the drive, you see the tree and you are in shock at the size. The park is fenced in with a small log building, a couple of portable toilets and a few picnic tables. The cabin has souvenirs and a couple of women selling sweetgrass baskets on the back screened in porch. But, you’re here to see the tree. You can’t get it all in one photo. It’s 65 feet tall and spreads over 17,000 square feet. The limbs are so heavy they’ve drooped to the ground. Ferns grow along limbs. You need to see people beside it to comprehend its size. After that intro, the tree speaks for itself, different from any side. 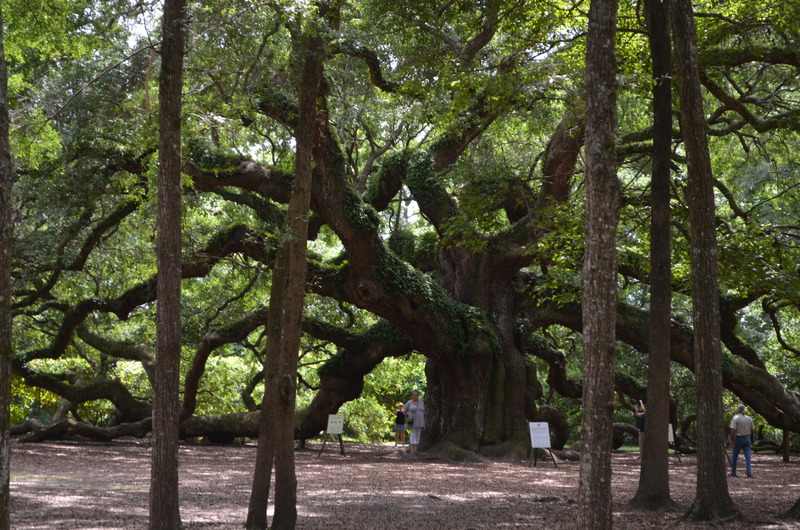 There are abundant signs reminding visitors not to climb the tree, which is tempting, and not to carve it. Horrors!! !